Last week we played our second session of “Tesla vs Edison: War of the Currents,” which is an Euro-style game covering the effort to electrify the Eastern United States (or most of the country in the 4-player version). 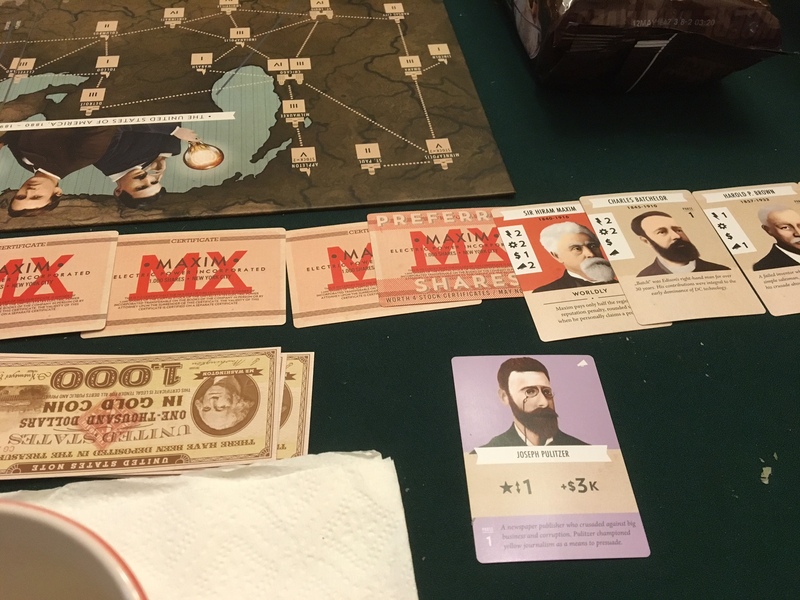 The cards at the bottom of this picture shows Maxim stock certificates and game money. And, as can be seen the game’s components are top notch. Players control an Inventor and his assistants, plus his supporters and backers. 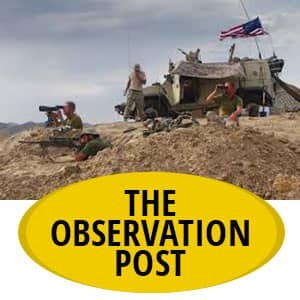 It involves AC and DC tracks, a Light Bulb Technology track, with patients, a Stock Market mechanism and a map of the U.S. 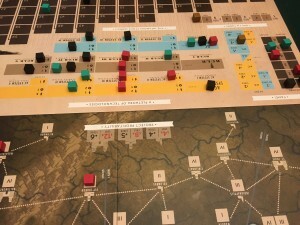 Here is an example of the three player map in action. For some reason it has Albany on the Great Lakes, which, I’m sure, will come as a great surprise to all those people who actually live in Albany. In our game, above, I controlled the red network, Mitch controlled the green network and John controled the black network. 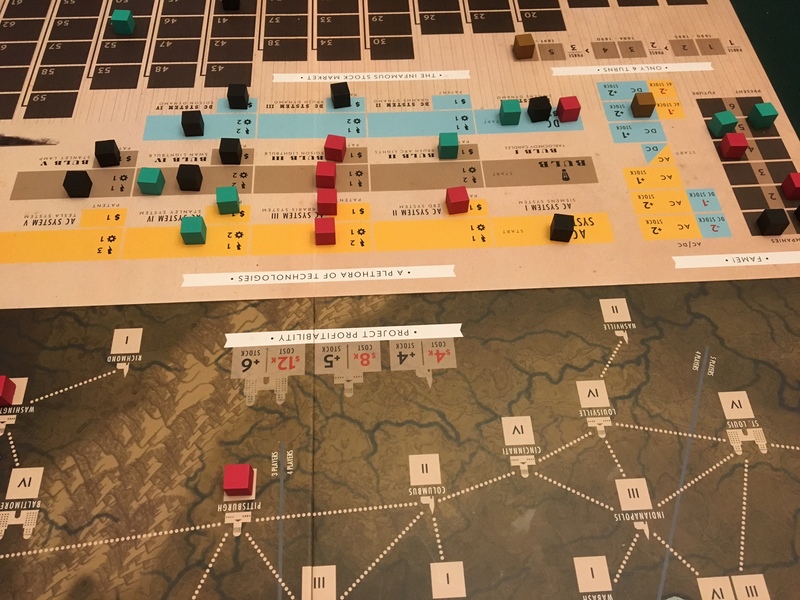 Due to some fancy stock manipulation in the last turn, John, who controlled the black “network” above, won. (yes, his network covered all of one city). The “Maxim” card is the one with a red background in the right-center. Stock certificates in his company are the red “MX” cards. His associates are placed next to him and help out with money and technology etc. The card in the lower right corner is a “propaganda” or “publicity” card. The blank portion of the map shown in the upper left corner was not used in a three-player game. The money provided in the game is surprisingly thick and can be seen in the lower left above. 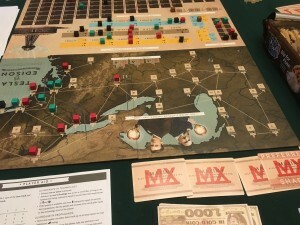 The stock market mechanism can be seen at the top of this picture (the black boxes), the tech tracks (with the red, green and black cubes) are in the center and part of the map can be seen at the bottom (with the pay-off boxes for small, medium and large cities). 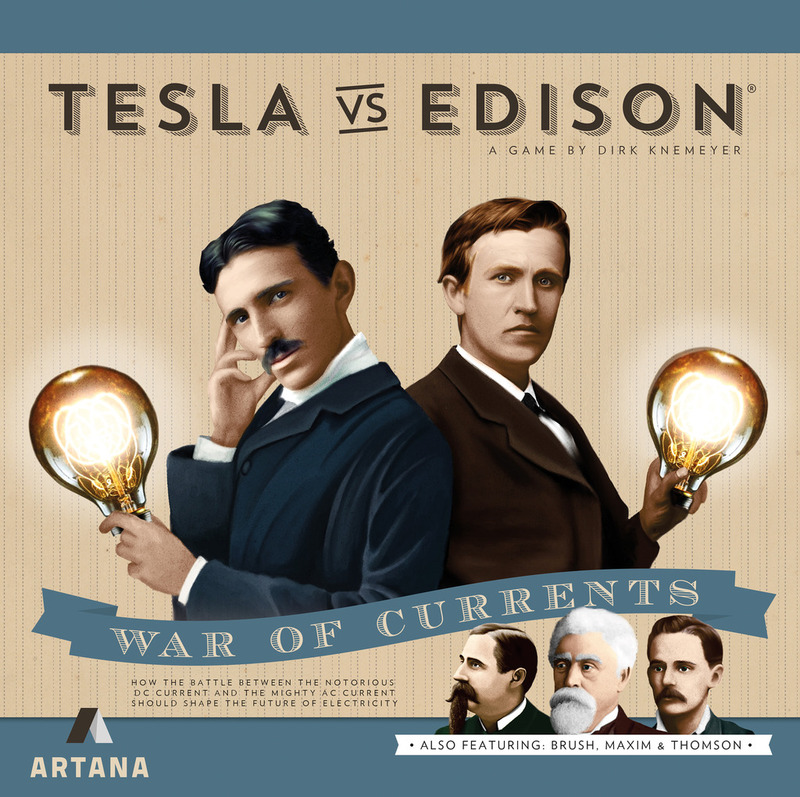 “Tesla vs Edison: War of the Currents” simulates the struggle to electrify the U.S. between Edison and Tesla/Westinghouse that took place in the 1880s and 1890s. Edison championed DC power and Tesla/Westinghouse backed AC. And if you are someone who likes networking, stock market and accounting games it does have a number of interesting mechanisms. In fact, it does remind me of “Power Grid” in many ways. Although I’d also say it would have profited from a bit more development. 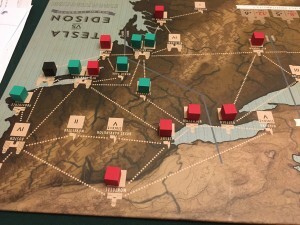 First, its map has a number of curious mistakes, second its main characters are a bit unbalanced (Edison being far and away the most powerful inventor to control) and most importantly, the game plays more like the “Erie Railroad Wars” of the 1860s than the “War of the Currents” in the 1880s. 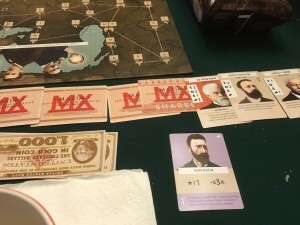 For example, in our game I controlled the inventor Hiram Maxim, and decided to concentrate on constructing as large a network as possible, which seemed a logical thing to do in a game called “War of the Currents.” Along the way I also increased my stock’s price to much more than double that of any other player and I controlled the great majority of my own stock. And, as what you make in the stock market is how you determine who wins, you’d think I was well on my way to achieving a sure-thing victory. But you’d be wrong. 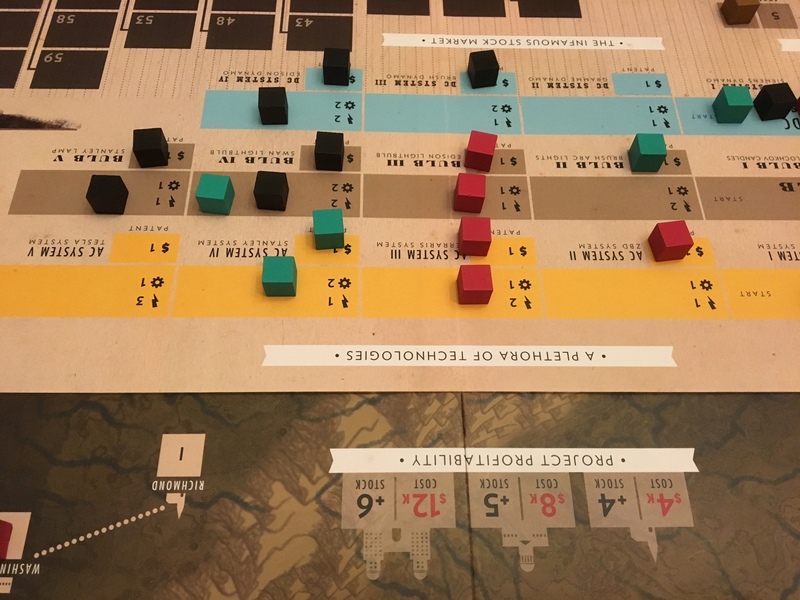 Unfortunately, while the game is called “Tesla vs Edison” it plays more like “Cornelius Vanderbilt vs Big Jim Fisk.” You see during the last turn my opponents manipulated the stock prices so that I finished third in a three player game. Of course, one could say that’s just how the game plays. 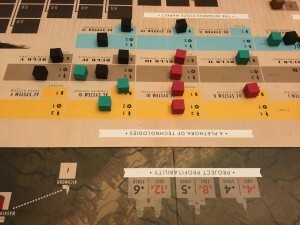 Now, I’ve heard that a second edition of “Tesla vs Edison” is coming out and one can hope that some of these problems will be addressed, but as far as the first edition of this game goes, it has some problems. 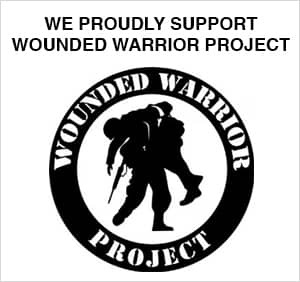 However, if you are aware of them and you don’t mind them, then this might be a game to look into.